Browse our most commonly asked questions which are categorized by topics. Simply click or tap the question you would like to view and the answer will be displayed below. If you still have further questions, please contact us and we’d be happy to talk to you. The placement of the arch support feels like it is the wrong place, what should I do? Some Zelus Insoles may feel differently than other insoles on the market today. Our design is engineered specifically to provide stability, support and cushion for the foot. Zelus Insoles have been designed to minimize impact forces. If you feel that the insole you purchased isn’t quite right please contact us here and we will recommend another style of Zelus Insoles for you to try. Am I supposed to trim my Zelus Insoles? Trimming is not necessary with Zelus Insoles. However, if you find that your full length insole is too long or wide you may find that trimming the insole will do just the trick to a get a perfect fit. Can I use Zelus Insoles with my pair of custom orthotics? We don’t recommend it. Typically multiple pairs of orthotics will raise your foot too high, resulting in blisters. You can try adding a Zelus Insole underneath your custom made orthotics. It really depends on your foot and your shoe and whether or not there is enough room in your shoe to accommodate both inserts. IF you decide to try this, we recommend using one of our no-frills flat design insoles. Shop our flat insoles here. 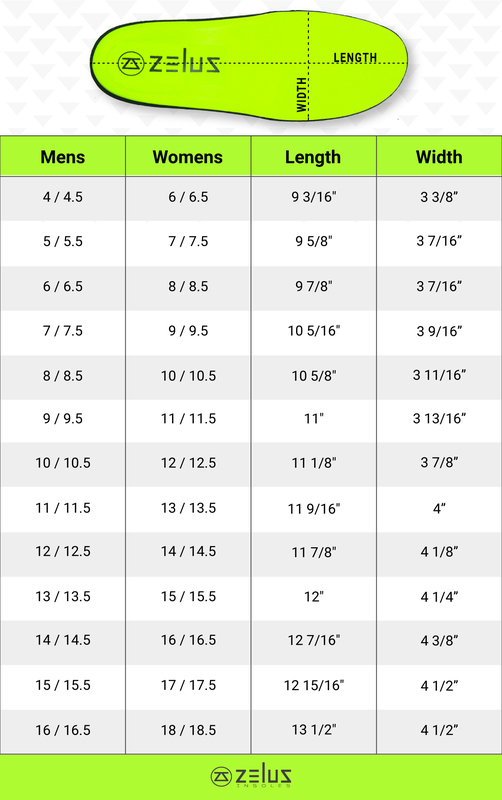 Simply choose the size that corresponds to your shoe size. If you wear a half size, that will be rounded down to the smaller size to ensure a proper fit. For more clarification view our SIZE GUIDE. How do I correctly insert my Zelus Insoles in my shoes? There are a few methods you can use to get your Zelus Insole into your shoe. One method is to place your hands on the top and bottom of the insole and wiggle your hands until you reach the end of the inside of your shoe. We also recommend pinching the insole together lengthwise, like a taco, as you slide your insole into your shoe. How do I clean my Zelus Insoles? Simply clean your insoles with a soft detergent or mild soap followed by an air dry. We do NOT recommend putting them in a washing machine. Do I need to remove the current insert in my shoe before I insert my Zelus Insole? YES, remove the insole that comes in your shoe before you insert your Zelus Insole. I don’t really have any pain, do I really need insoles? Although you may not have pain today, Zelus Insoles are designed to help you reduce and prevent future pain. Would you go without changing the oil on your car just because it is running well today? Would you go without brushing your teeth just because you don’t have cavities today? Of course not! The same rings true for performance insoles. Zelus Insoles are designed and optimized to reduce the pain you may already have today and help reduce and prevent future pain and issues. I stand all day at work, which Zelus Insoles are right for me? If you need arch support then you’ll probably want the Olympus. If you’re looking for extra cushion without the arch support, check out the Sprintus. Will these fit in my work boots? Zelus Insoles should fit in any type of work boots depending on the type of boot you have. If your boots have a tight toe box then we would recommend our flat cushioning insoles. If you have a roomy toe box, take a look at our arch support insoles. Remember to first remove the insole that comes standard in your shoe before you insert your Zelus Insole. I wear boots with waterproof liners, like GORE-TEX, will Zelus Insoles still work for me? Yes, you can use Zelus Insoles along with a liner or other layer. We recommend choosing one of our flat no-frills models if you are planning to wear the Zelus Insole along with other layers in your shoe or boot. Check out our flat insoles here! Yes, actually any of our insoles can be used for running. However, we recommend the Olympus model for high impact activities, like running. Click here to view the Olympus! What are the main differences between the flat insoles and arch support insoles? Zelus arch support insoles provide maximum cushion, stability and support by use of a pre-molded, thermoplastic core. Our flat cushioning insoles provide a stable, level surface with several cushioning layers. I have flat feet, which Zelus Insoles should I choose? As all feet and people are different, there is not one specific insole designed for flat feet. To pick the right insole for your foot start by selecting the activity you will be performing and the shoe type you will be wearing. Any of the Zelus Insoles can be worn by flat-footed folks. How long will Zelus Insoles last me? You can count on Zelus Insoles to provide you with up to 500 miles of wear and tear, or up to 12 months of consistent support, whichever comes first. How much do Zelus insoles weigh? What are SmartCells and how do they help? SmartCells® is a patented cushioning technology designed to provide a stable surface while also absorbing up to 90% of impact forces. Our spring-like technology compresses on impact and immediately returns that energy without ever bottoming out. What are the main components that make up your insole? All Zelus Insoles are made of high quality, durable materials designed to outlast any other insole. Our products feature SmartCells micro and nano cells, professional grade top covers, cushioning mid-layers, and a thermoplastic core for insoles with arch support. How is your arch support formed? Will it fit my arch? Zelus arch support insoles are formed using a patented molding technology designed by our sister company, Fastech Labs. The Fastech system is designed for injury prevention and enhanced performance while supporting the foot where it functions best; in a neutral position. What are the shipping costs for the USA? For bulk orders, please contact us directly at 1-888-be-zelus. Shipping is $6.99 for one pair of Zelus Insoles, $8.99 for two pairs of Zelus Insoles, and $10.99 for three pairs of Zelus Insoles. For large/bulk orders please contact us directly at humans@zelusinsoles.com. Sorry, at this time we do not ship internationally. We have a 30-Day Satisfaction Guarantee. We want you to Feel the Zeal and experience your new Zelus Insoles. So, go for it and try our insoles in your footwear, even trim them if necessary. If you are not feeling it, and aren’t fully satisfied, please contact us at humans@zelusinsoles.com and we will work with you to make it right.